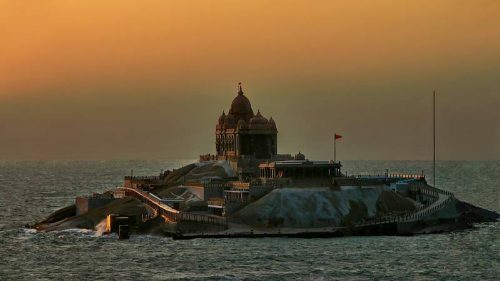 Padma Bhargav : It is a moment of immense pride and honour for all of us, Bharatvasis that Vivekananda Kendra, Kanyakumari will be celebrating the 50th year of Vivekananda Rock Memorial next year and at this juncture it has been awarded with the prestigious Gandhi Peace Prize for the year 2015. Looking back, after construction of VivekanandaRock Memorial in 1970, Mananeeya Eknathji, founder of Vivekananda Kendra, considered a living memorial in the heart of the youth would be an appropriate tribute to Swami Vivekananda. The idea was conceived by the thought of Swami Vivekananda, “A hundred thousand men and women fired with the zeal of holiness, fortified with the eternal faith in Lord, nerved to the lion’s courage by their sympathy for the poor and the fallen and the downtrodden will go over the length and the breadth of the land preaching the gospel of salvation, gospel of help, the gospel of social raising-up, the gospel of equality”. Vivekananda Kendra has received this award for its magnanimous work that it carries out through its two kinds of activities, one the organisational projects and two, the service projects. These projects are accomplished through its 830 activity centers running all over the country. Vivekananda Kendra works both in formal and informal education through its service projects as well as branch centers. Vivekananda Kendra Vidyalayas or VKVs are functioning in various states, viz., 37 in Arunachal Pradesh, 24 in Assam, one in Nagaland, 10 in Andamans and 3 in the south of India. There are total 75Vidyalayas. Why was Arunachal Pradesh chosen? During 1962 Chinese invasion, the people of this state had to face lots of problems because of lack of proper communication facilities. Mananeeya Eknathji, realised that in the absence of a strong sense of Nationalism, no amount of army can secure the national integrity for long and protect our people there. He laid emphasis in Arunachal Pradesh in particular and North East in general because of its geographical uniqueness. North East shares 98% of its border with international boundary and only 2% with Bharat. It was very difficult to work in Arunachal Pradesh during initial periods as there were no proper roads, no conveyance modes added with frequent landslides, floods etc. Children used to come from remotest villages walking for seven days to reach their schools. Therefore, Kendra opted for residential schools. Seeing the transformation in children, today VKV has become a brand name in Arunachal Pradesh. The students are excelling in all the fields. In the science subject, they shine at national and sometimes even at international level. They are good in sports, and the schools have excellent academic results as well as the discipline and development of students is lauded all over. The VKV Alumni is in all fields like IAS officers, defense, education, entrepreneurs etc. 18 independent schools are being run by the Alumni of VKVs in Arunachal Pradesh. The same story of excellence continues in Assam, Andamans, Nagaland and southern schools which are run for rural children. The Kendra is running 120 Anandalayasin the tea gardens of Assam. This initiative has deeply impacted the social life of tea garden families. It helped to improve the quality of life of the tea garden workers and their children. Similarly, in Deobandh, Keonjhar district of Odisha, there was a high drop-out rate at the primary level. If the child did not do well at the primary level then the child was dropped-out in the sixth standard. After the Kendra’s initiative the drop-out rate came to zero, because the teachers and the students were now boosted up. At present, 227 Anandalayas and over 200 Balwadis are being run by Vivekananda Kendra. Today, the students are not getting the education in formal set up that can help them build a strong character. Therefore, for both, school and college students Vivekananda Kendra conducts 565 Samskar Vargas for around 17,000 children, 147 SwadhyayaVargas for 2500 college students and youth development programs through process of a quality text, one day workshops and residential camps for 65,000 youth of around 748 colleges. Swami Vivekananda had insisted that along with economic development cultural and spiritual development is also essential. Therefore, the rural development projects of Vivekananda Kendra are being carried out in South Tamilnadu, Nashik in Maharashtra, Keonjhar and Sambhalpur districts in Odisha, in Assam and in Arunachal Pradesh with focus on the material well-being as well as all-round development of the beneficiaries. Balwadisfor small children are running where nutrition is being provided to them. Not only that, the Kendras spot the rural talents and helping them in their schools. Similarly, leadership development, skill development in plumbing, home-nursing, motor mechanic etc. are being done for youth and weaving and tailoring centers are being run for women. The Kendra also runs medical centers, organises regular medical and surgery camps, mobile medical vans and Arogyarakshakscheme in the interior areas. A very interesting scheme run by the Kendra is “Adopt a Granny”, wherein the old women are taken care off by giving them a pair of clothes and monthly provisions. ThroughDeepa Puja, the rural women are educated about health, hygiene and also the tips for up-bringing of children. Amruta Surabhi is a special scheme through which a fist full of grain is kept aside everyday by the house holders or bag full of rice by the farmers during harvesting period. Approximately, Rs. 35,000 worth of rice collected in these ways is used for feeding old women, children and also given to orphanages from time to time. VK-NARDEP is an integral project of Vivekananda Kendra Kanyakumari. It was started in 1986 inspired by Indic vision of the seers: Isavasyam idam Sarvam – All Existence is permeated by Divine and Swami Vivekananda’s clarion call to uplift the downtrodden masses. VK-NARDEPcombines traditional wisdom and modern science and provides cost-effective alternative holistic solutions to the problems of modern living – especially for the rural communities. Under this, NARDEP has disseminated more than thirty five eco-friendly technologies, conducts training and awareness programs, gives live model demonstrations for masons, engineers etc., runs Rural Building center. Community water harvesting, roof water harvesting, deepening and revival of traditional water harvesting structures, model for urban and rural rain water harvesting projects are carried out through this activity. It is no wonder that VK-NARDEP was awarded with “Bhoomijal Samvardhan Puraskar” – 2007 by Ministry of Water Resources, Government of India for its contribution to the conservation of ground water through community efforts. Sustainable agriculture is another field where VK-NARDEP has worked in a big way. It gives bio-gas slurry based organic inputs for agriculture, backyard Azolla cultivation as bio-feed for poultry and livestock, organic formulations for growth promoters and pest management, documentation of traditional knowledge of agricultural practices. Azolla technology received the NRDC (National Research Development Corporation) Social Innovation award, New Delhi in 2008. Through this activity, NARDEP is aiding in Green Health home, organizing rural health awareness and mass medical camps, rural home health gardens, documentation of traditional medical knowledge, preparing herbal medicines through rural women SHG’s. Green Health Home has trained more than 1000 doctors and vaidyasfrom southern part of India in the art and science of Varma Chikitsasince one decade. Now it has become a “Varma Resource Center”. In the field of renewable energy, VK-NARDEP has helped in the construction of cow-dung based bio-gas plants throughout India, provided manual for bio-gas plant users and masons, organized awareness and training programs for masons and general public, conducts research for developing new models of bio-gas plants. In recognition of its valuable contribution to the field of renewable energy and agriculture, it was awarded the coveted “International Ashden” award in the year 2006. In the year 2009 VK-NARDEP received NRDC award for its project to generate bio-gas through aquatic water weeds. VK-Nardep’s “Shakti Surabhi” Bio-methanation model received patents from Sri Lanka, China, South Africa and India. Inner sustainability is one of the core activities of VK-NARDEP that has received high accolades and recognition from various quarters. Motivation workshops, personality development workshops for various sections of the society including government agencies, Panchayat presidents, social workers, NGO’s, self-help groups, students etc. are conducted on regular basis. Apart from that, it publishes books on sustainable development and more than 50 titles in Hindi, Tamil and English have been published. Refresher courses and motivation camps for government officials are also organized. It is networking with other voluntary organizations and scientific institutions and conducts Eco-camps for school and college students. This is an initiative by Vivekananda Kendra – NARDEP to make Rameswaram clean and green and it is working as a catalytic agent for creating green resilient Rameswaram. It is working with many partner organisations, scientific institutions, local stakeholders, state and central government. The project was launched on 28th January 2014 by late Dr.A.P.J. Abdul Kalam while the action plan was released by Honorable Prime Minister Shri. Narendra Modi on 27th July, 2017. The Vivekananda Kendra strategists are also working in Haryana and Punjab since 2012-13, it was the time when Kendra was celebrating 150th birth anniversary of Swami Vivekananda. At present, it has branches in Faridabad, Gurugram, Rewari, Bhiwani, Narnaul, Rohtak, Sonipat, Panipat, Karnal and Panchkula under Haryana prant and also at Chandigarh, Ludhiana, Amritsar and Pathankot under Punjab prant. Weekly sanskar Vargas for children, Swadhyay vargas for youth are being organized and along with that different celebrations and programs are carried on by these kendras.